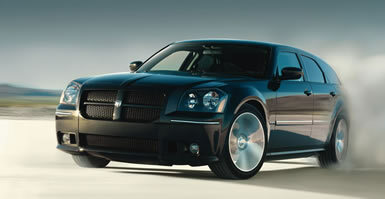 San Francisco: The Dodge Magnum combines a muscular shape with up to 425 horsepower to create one of the wildest grocery-getters on the road. Other than an SUV-like ride height, the Magnum's interior laid out like an ordinary sedan. It's practical, comfortable and easy to step in and out of. It's becoming harder and harder for a reasonably image-conscious person to buy a new car. Too many choices out there leave you open for criticism. Want to buy an SUV? You can't do that unless you want the environmentalists accusing you of killing the rainforests, depleting the ozone layer and wasting the world's oil supplies. Want an ordinary family car? That's a no-go unless you want your friends thinking you've completely sacrificed your unique sense of style to buy a boring sedan. How about a fancy sports car? Well, everybody on the road will think you're either going through a mid-life crisis or you're an obnoxious trust-fund kid. The list gets narrowed down pretty quickly if you keep following the same line of thought, so it's tough to find a car that meets your needs for basic transportation and satisfies your lust for something exciting and different at the same time. It would be nice to find a practical car that didn't come with the baggage that practical cars usually do. Enter the Dodge Magnum. It's first and foremost a practical car with the same layout as a station wagon or small SUV, offering a huge cargo area and roomy, comfortable transportation for five people. It's laid out very much like reasonable, everyday, ordinary transportation. Still, it's anything but ordinary. For starters, it's nearly impossible to ignore the wagon's sleek, futuristic lines and truck-like nose - an obvious Dodge Ram rip-off. It has a squatty, muscular, athletic look that seems to be influenced by American street rods, giving it the self confidence and spunky personality that so many of today's cars lack, along with the tough, rugged attitude of an SUV. It's also available in four delicious flavors that range from a good-looking grocery getter to a wild, tire-spinning muscle wagon that would make hot-rod lovers drool. The base model, called the SE ($22,420), comes with a 2.7-liter V6 engine that makes 190 horsepower. It comes standard with a four-speed automatic transmission, air conditioning, power windows and locks, cruise control, remote entry and some other goodies. Step up to the SXT ($26,470) and you'll get a bigger, 3.5-liter V6 and a five-speed automatic. It also comes with antilock brakes, traction control and an eight-way power driver's seat along with a few other extras. Still another step higher is the R/T ($30,245), which comes with Dodge's famous 5.7-liter Hemi V8 that makes a tire-smoking 340 horsepower and even more goodies to improve the style and comfort. At the top of the range is the ultra-high-performance SRT-8 ($37,320), which comes with a 6.1-liter V8 Hemi that makes 425 horsepower - enough to take it from zero to 60 miles per hour in about five seconds. The Hemi is one of the best engines on the market today, and not only for its way-cool, muscle-car name. It's powerful enough to feel like a Boeing jet taking off every time the light turns green, but it's also relatively smooth and quiet - certainly more refined than other V8s offered in Dodge trucks of recent vintage. Better yet, the engine can deactivate four cylinders when it doesn't need the power from all eight. It results in about 20 percent fuel savings, Dodge claims, even though you can't feel when the engine changes from four-cylinder to eight-cylinder mode. It's a seamless transition. Although the base Magnum is rear-wheel drive in the grand muscle-car tradition, all-wheel drive is available on the SXT and RT models to offer more balanced power for cornering and more traction on snowy or wet roads. Coupled with electronic traction and stability control, it's about as failsafe as cars can get. If you care more about the functionality of your vehicle than the style or power, the Magnum still delivers. The interior is spacious and nice looking, offering ample room in both the front and back seats. When you need to haul something from the home improvement store, you can fold down the back seat to create a cavernous cargo area that rivals many SUVs. My only gripe has to do with the cruise control lever, which has got to be one of the most idiotic control systems ever devised. It's a stick that moves in five different directions to do five different functions. You move it one way to engage cruise control, a second way to set your speed, a third way to accelerate, a fourth way to decelerate, and a fifth way to cancel cruise control. I doubt politicians could develop a more needlessly complex control to do something so simple. All in all, the Dodge Magnum is stylish, practical car with very few drawbacks. If you want a family car that doesn't behave like one, take it for a spin. You'll fall in love.